I originally found these recipes in one of those free magazines you can pick up at the health food stores. There were a couple of recipes that we tried from this one cookbook and I thought they were so good that I was inspired to buy the cookbook from which they were from. But I am not as enamored with the cookbook as with these specific recipes. If you are a flexitarian or carnivore, you may appreciate the cookbook more as there are a lot of meat based Thai dishes. I also need to pull the cookbook back out and look through it again. The tofu dish we have had quite a few times before and we really like it. As usual, I added more vegetables to this recipe. I also changed the sauce slightly from the original. This was the first time I made the cucumber salad and my husband dug into that right away. He gave it ‘two thumbs up’ before I even got sat down in my chair. I’ll admit that I couldn’t keep my fingers out of it while I was making the tofu. Turn on rice cooker. Slice tofu into 8 slices and place between the layers of a clean, dry towel. Place something heavy on top and let it sit for at least 10 minutes. Slice each tofu slice into 8 squares. Heat 2 tbsp of oil in large wok or skillet. Carefully add tofu – it will splatter. Let cook for 3-4 minutes and then flip and let cook for 3-4 more minutes or until golden brown. Remove from pan and place on a paper towel covered plate. Add 1 tbsp oil to hot pan. Add shallots and garlic. Stir fry for one minute – careful not to burn the garlic. Add the carrots, bell pepper and green beans. Let cook for 3-4 minutes. Stir in remaining ingredients and let cook for a couple more minutes or until carrots are tender-crisp. Add tofu back to pan and cook until heated through. Serve with rice. Mix together vinegar, soy sauce and sugar. Add remaining ingredients, except peanuts, and let sit for 15 minutes. Serve topped with peanuts. It might be a tad spicy for the little ones, depending on how much red pepper flakes you put in. You might try it without the flakes first as I would imagine it still has a great flavor with the soy and lime. You might also cut back on the black pepper too the first time around. It also depends on how brave the kiddos are! Let me know if you try it! I have just recently discovered how to actually COOK tofu so it doesn’t turn into a mushy mess. Now, I’m sold, and this recipe sounds like a GREAT opportunity to use it! Extra firm tofu is the way to go to keep it from going mushy. And pressing out as much water as you can between towels. I try not to fry tofu in oil too often because it seems to need sooo much oil in order to brown nicely. But periodcically I will and then I will fry the tofu first and then remove it to a plate with some paper towels on it to try and soak up some of the extra oil. I have also been using other techniques such as freezing the tofu and then thawing before use as well as dry frying in a cast iron skillet. Both make a chewier and/or crispier tofu. I haven’t tried a tofu press yet. 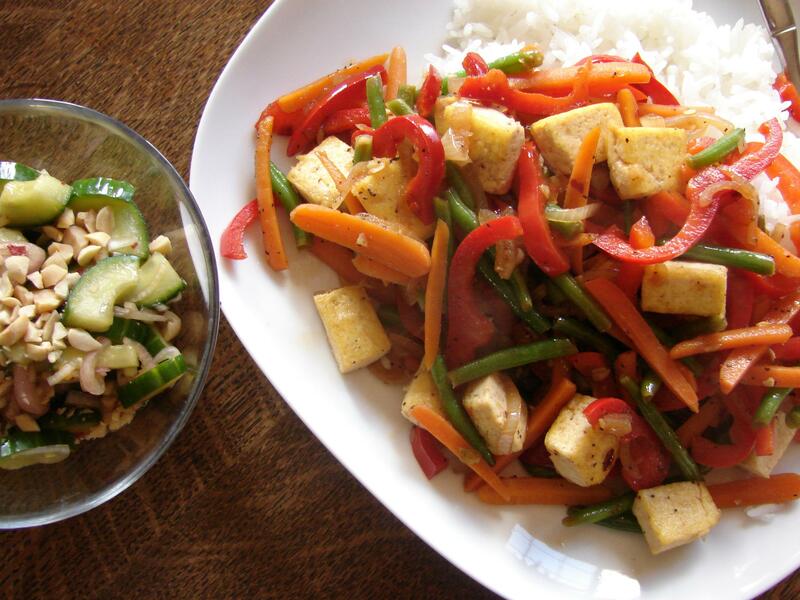 To me tofu is a lot like zucchini…not a lot of flavor by itself but it picks up a lot of other flavors well. But it is an acquired taste. My husband ate it frequently before we met up and he taught me to enjoy it.